For the royalty trust that trades on the New York Stock Exchange, see Permian Basin Royalty Trust. Not to be confused with Permian Basin (Europe). 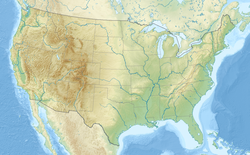 The Permian Basin is a large sedimentary basin in the southwestern part of the United States. The basin contains the Mid-Continent Oil Field province. This sedimentary basin is located in western Texas and southeastern New Mexico. It reaches from just south of Lubbock, past Midland and Odessa, south nearly to the Rio Grande River in southern West Central Texas, and extending westward into the southeastern part of New Mexico. It is so named because it has one of the world's thickest deposits of rocks from the Permian geologic period. The greater Permian Basin comprises several component basins; of these, the Midland Basin is the largest, Delaware Basin is the second largest, and Marfa Basin is the smallest. The Permian Basin covers more than 86,000 square miles (220,000 km2), and extends across an area approximately 250 miles (400 km) wide and 300 miles (480 km) long. The Permian Basin lends its name to a large oil and natural gas producing area, part of the Mid-Continent Oil Producing Area. Total production for that region up to the beginning of 1993 was over 14.9 billion barrels (2.37×109 m3). The cities of Midland, Texas, Odessa, Texas and San Angelo, Texas serve as the headquarters for oil production activities in the basin. The Delaware Basin is the larger of the two major lobes of the Permian Basin within the foreland of the Ouachita–Marathon thrust belt separated by the Central Basin Platform. The basin contains sediment dating to Pennsylvanian, Wolfcampian (Wolfcamp Formation), Leonardian (Avalon Shale), and early Guadalupian times. 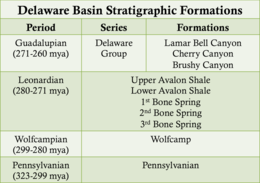 The eastward-dipping Delaware basin is subdivided into several formations (Figure 2) and contains approximately 25,000 feet (7,600 m) of laminated siltstone and sandstone. Aside from clastic sediment, the Delaware basin also contains carbonate deposits of the Delaware Group, originating from the Guadalupian times when the Hovey Channel allowed access from the sea into the basin. The westward-dipping Midland Basin is subdivided into several formations (Figure 4) and is composed of laminated siltstone and sandstone. The Midland Basin was filled via a large subaqueous delta that deposited clastic sediment into the basin. Aside from clastic sediment, the Midland Basin also contains carbonate deposits originating from the Guadalupian times when the Hovey Channel allowed access from the sea into the basin. The Central Basin Platform (CBP) is a tectonically uplifted basement block capped by a carbonate platform. 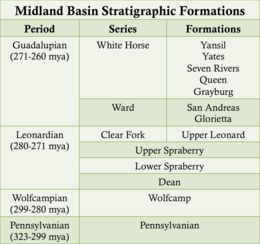 The CBP separates the Delaware and Midland Basins and is subdivided into several formations, from oldest to youngest Wolfcamp, Abo, Drinkard, Tubb, Blinebry, Paddock, Glorietta, San Andres, Grayburg, Queen, Seven Rivers, Yates, and Tansill Formations (Figure 5). The sequence mainly comprises carbonate reef deposits and shallow marine clastic sediments. The Eastern and Northwestern Shelves are composed of shelf edge reefs and shelf carbonates flanking the Delaware and Midland Basins that grade up-dip into siltstones and evaporites. The Eastern and Northwestern Shelves are subdivided into the San Andres, Grayburg, Queen, Seven Rivers, Yates, and Tansill Formations. The San Simon Channel is a narrow syncline that separated the Central Basin Platform from the Northwestern Shelf during Leonardian and Guadalupian times. The Sheffield Channel separates the southern margin of the Midland Basin from the southern shelf and the Ouachita–Marathon thrust-belt during Leonardian and Guadalupian times. The Hovey Channel is a topographical low located on the southern edge of the Delaware Basin, allowing access to the Panthalassa sea during Guadalupian times. The Hovey Channel was originally an anticline which formed during Precambrian faulting, and was the main source of sea water for the Delaware Basin. The closing of the Hovey Channel towards the end of the Permian Period eventually caused the death of the Permian Reef, as without water being brought in through the Channel, salinity levels rose drastically in the Delaware Basin and the reef could not survive. The Horseshoe Atoll is a westward-tilting arcuate chain of reef mounds 175 miles (282 km) long located in the Midland Basin, consisting of 1,804 feet (550 m) of limestone accumulated in the Pennsylvanian and 1,099 feet (335 m) in the Permian, with 15 significant reservoirs from 6,099 feet (1,859 m) to 9,902 feet (3,018 m) in depth. The reef complex consists of Upper Pennsylvanian Strawn, Canyon and Cisco limestones, overlain by Lower Permian Wolfcamp sandstones and shales of terrigenous origin prograding northeast to southwest. The first production well, Seabird Oil Company of Delaware No. 1-B J. C. Caldwell, was completed in 1948. The Permian Basin is the thickest deposit of Permian aged rocks on Earth which were rapidly deposited during the collision of North America and Gondwana (South America and Africa) between the late Mississippian through the Permian. The Permian Basin also includes formations that date back to the Ordovician Period (445 mya). Prior to the breakup of the Precambrian supercontinent and the formation of the modern Permian Basin geometry, shallow marine sedimentation onto the ancestral Tobosa Basin characterized the passive margin, shallow marine environment. The Tobosa Basin also contains basement rock that dates back to 1330 million years ago (mya), and that is still visible in the present-day Guadalupe Mountains. The basement rock contains biotite-quartz granite, discovered at a depth of 12,621 feet (3,847 m). In the nearby Apache and Glass Mountains, the basement rock is made of metamorphosed sandstone and Precambrian-aged granite. The entire area is also underlain by layered mafic rocks, which are thought to be a part of Pecos Mafic Igneous Suite, and extends 220 miles (360 km) into the southern US. It has been dated to 1163 mya. Each period from the Paleozoic Era has contributed a specific lithology to the Tobosa Basin, accumulating into almost 6,600 feet (2,000 m) of sediment at the start of the Pennsylvanian Period (323.2 – 298.9 mya). The Montoya Group is the youngest rock formation in the Tobosa Basin and was formed in the Ordovician Period (485.4 - 443.8 mya), and sit directly on the igneous and metamorphic basement rocks. The rocks from the Montoya Group are descried as light to medium grey, fine to medium grained crystalline calcareous dolomite. These rocks were sometimes inter-bedded with shale, dark grey limestone, and, less commonly, chert. the Montoya Group sequence is made up of carbonate limestone and dolomite which is described as dense, impermeable, and non-porous, and is more commonly found in the Glass Mountains outcrop, with thickness varying from 151 to 509 feet (46 to 155 m). During the Silurian Period, the Tobosa Basin experienced dramatic changes in sea level which led to the formation of multiple rock groups. The first of these groups, called the Fusselman Formation, is mostly made up of light grey, medium to coarse grained dolomite. The thickness of this formation varies from 49 to 164 feet (15 to 50 m), and parts of the Fusselman Formation were also subject to karstification, which indicates a drop in sea level. The second rock group that formed during the Silurian Period is called the Wristen Formation, which is mud, shale, and dolomite rich rock that reaches a thickness of 1,480 feet (450 m) in some places. Karstification of the Fusselman Formation shows that a drop in sea level occurred, but sea levels rose again during a transgressive event, which lead to the creation of the Wristen Formation. Sea levels would then drop again, which led to major exposure, erosion, and karstification of these formations. The Thirtyone Formation was developed during the Devonian Period. This formation is characterized by its limestone, chert, and shale beds, some of which had a peak thickness of 980 feet (300 m). this formation had many different types of limestone, including light-colored siliceous, chert-dominated, crinoid-rich, and sandy limestone. The Thirtyone Formation is very similar to the formation of the Mississippian Period, which is likely because there was little to no change in the environment during this time. The Mississippian Limestone is the main formation to develop during this Period. This formation, similar to the previously mentioned Thirtyone Formation, is composed primarily of limestone and shale. The limestone beds are described as being "brown to dark brown, micro-crystalline to very finely crystalline, commonly sandy, and dolomitic", while the shale beds are "grey to black, hard, platy, pyritic, organic, and very siliceous". The Mississippian Limestone ranges from between 49 to 171 feet (15 to 52 m) in thickness, while generally being thinner towards the southern part of the Tobosa Basin. The Barnett Shale is the second formation to have developed during the Mississippian Period. It consists mainly of silty brown shale and fine-grained sandstone and siltstone. This Formation was much thicker than the Mississippian Limestone, ranging from 200 to 460 feet (60 to 140 m). The increased thickness can be explained by increased sedimentation in the area, which was likely caused by tectonic activity in the region. The Ouachita Orogeny occurred during the Late Mississippian, leading to tectonic activity in the region. The subsequent folding and faulting caused by this Orogeny led to the Tobosa Basin being divided into three sections: the Delaware Basin, the Midland Basin, and the Central Basin Platform. the end of the Mississippian Period also led to the beginning of the formation of the modern Permian Reef Complex. The legacy of the early to mid Paleozoic is almost 6,600 feet (2,000 m) of sediments that were accumulated due to almost uninterrupted sedimentation. The Pennsylvanian Period marked the beginning of geological processes that would shape the Permian Basin into what we see today. As previously mentioned, rifting events during the Cambrian Period (early Paleozoic) left fault zones in the region. This fault zones acted as planes of weakness for faulting that was later initiated by the Ouachita Orogeny. These fault zones caused the Tobosa Basin to be transformed, due to tectonic activity, into the Permian Reef Complex, which comprises three parts: the Central Basin Platform, which is encircled by faults, and the Midland and Delaware Basins on either side. The Delaware Basin is the most important of these three basins. The Pennsylvanian Period also marked the beginning of climate change, as the world would begin its deglaciation while changing from an icehouse to greenhouse climate. Due to all the tectonic changes that were occurring in the area, certain parts of the former Tobosa Basin were uplifted and exposed to erosion. The newly-formed Delaware Basin was exposed down to the Montoya Group (Ordovician Period), while other parts of the Reef Complex were exposed down to the Precambrian basement rock. The eroded sediments were redeposited onto the shelf of the Delaware Basin, which led to almost 3,000 feet (900 m) of sediment being deposited over the course of the Pennsylvanian. The main formation from the Pennsylvanian Period is called the Morrow Formation, which reaches a thickness of around 1,600 feet (500 m) in the Delaware Basin. Due to the variance in composition, this formation is usually divided into 3 parts: the Lower, Middle, and Upper Morrow. the Lower Morrow is formed from coarse-grained sandstone and inter-bedded limestone and shale. The Middle Morrow, also referred to as the Morrow Shale, is composed of shale and sandstone. These two parts of the Morrow Formation reach almost 1,600 feet (500 m) in thickness. the last part of this formation, the Upper Morrow, is made up of inter-bedded limestone and sandstone. The Morrow Formation lies conformably on top of the previous Mississippian Formation, with classic sediments visibly prograding across the two formations. As the Mississippian changed to the Pennsylvanian, the sandstone across the two formations changed from a marine source to a deltaic environment, with the sandstone from the Morrow Formation having been shown to be from a fluvial deltaic source. This change is attributed to an increase in sediment deposition form channels and point bars in the surrounding basin highlands, such as the Pedernal Highlands and the Central Basin Platform Highlands. The Pennsylvanian Period also led to the development of other geologic formations, although none had the importance of the Morrow Formation. The Atoka Formation lies conformably on top of the Morrow Formation, and is characterized by its fossil-rich limestone inter-bedded with shale, reaching a max thickness of 660 feet (200 m). During the formation of the Atoka, uplift was still occurring in the region, leading to increased sedimentation as the surrounding highlands were eroded. The increased sedimentation led to the formation of medium- to coarse-grained sandstone. In the Atoka Formation, the first reef structures that formed in the Delaware Basin are visible. The Strawn Formation formed after the Atoka, also during the Pennsylvanian Period, and reached a max thickness of 660 feet (200 m). In this formation, there was a signficant increase in reef mounds. The Strawn Formation is primarily made up of massive limestone, along with “fine to medium-grained sandstone, dark to light-grey shale, and occasional reddish-brown, greenish-gray, bituminous shale”. A great number of different fossil types were preserved in this formation, including brachiopods, foraminifera, bryozoans, corals, and crinoids. The Pennsylvanian Period also includes two other formations, the Canyon and Cisco Formations, which are significant due to the major oil reservoirs discovered in them. The Permian Period was a time of major reef building to transform the Permian Reef Complex into a major reef system, with Permian-aged rock formations making up 95% of the present-day outcrops in the Permian Basin. When considering any type of reef building that occurred in the Permian, it is important to keep in mind that tectonics played a major activity. During this period, the supercontinent of Pangaea, which lasted from between 335 to 175 mya, started undergoing breakup. Pangea was clustered together near the equator and surrounded by the superocean Panthalassa, with the Permian Basin located on its western edge within 5-10 degrees of the equator. Any reef building environment would need a source of water, and the Delaware Basin was located near a marginal sea. Thanks to the Hovey Channel, this sea transported water into the Delaware Basin. Global temperatures during this time were warm, as the world climate was changing from icehouse to greenhouse. This rise in global temperatures also led to the melting of ice masses located towards the South Pole, which then led to a rise in sea levels. The Permian Period has been split up into main Epochs, each of which has separate subdivision. In each sub epoch, a different formation was formed in the different parts of the Permian Reef Complex. The Cisularian Epoch contained two ages, the Wolfcampian and the Leonardian, both of which have a geological formation in the Permian Basin named after them. 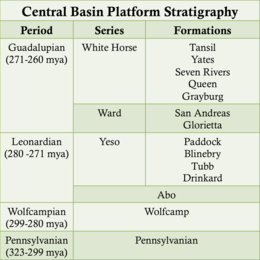 The Wolfcampian Formation lies conformably on top of the Pennsylvanian Formation and is the first formation from the Permian Period. Its composition varies depending on its location in the Basin, with the northern most part being more rich in shale. The thickness of this formation also varies, reaching a maximum of 1,600 feet (500 m). The Wolfcampian is made up primarily of grey to brown shale and fine-grained, chert-dominated, brown limestone. There are also interbedded layers of fine-grained sandstone found within the formation. The primary formation that remains from the Leonardian Age is called the Bone Spring Limestone, which reaches a max thickness of 2,000 feet (600 m) and lies directly below the Capitan Reef Complex. The Bone Spring limestone can be divided into two formations: the Victorio Peak Member, which consists of massive beds of limestone measuring up to 98 feet (30 m); and the Cutoff Shale Member, which is formed from black, platy, siliceous shale and shaley sandstone. The Bone Spring Limestone consists of several fossils, such as bryozoans, crinoids, and spirifers, but lack algae and sponges that are plentiful in the rest of the Permian Reef Complex. Rocks from the Bone Spring Limestone are predominantly found in the Delaware Basin, but the Victorio Peak Member extends into the shelf margin area. The Guadalupian Epoch was named after the Guadalupe Mountains, since this epoch in the Permian is when reef building was at its most efficient. Lasting from approximately 272 – 260 mya, this epoch was dominated by the Delaware Mountain Group, which can be further subdivided into rock divisions based on location in the Permian Reef Complex. The first formation that makes up the Delaware Mountain Group is the Brushy Canyon Formation, and it lies in the Delaware Basin. The Brushy Canyon Formation is made up of thin interbedded layers of alternating fine grained and massive quartz sandstone, as well as shaley brown to black sandstone. This formation reaches a maximum thickness of 1,150 feet (350 m) but thins out significantly as it approaches the basin margins due to transgressive onlap. The Brushy Canyon Formation also contains small reef patches, ripple marks, and crossed bedded strata, that indicate that the Delaware Basin had a shallow water environment at this time. The next unit of the Delaware Mountain Group is the Cherry Canyon, which had multiple different sub-units and extended into the Delaware Basin and the surrounding shelf environments. The Cherry Canyon Formation can be subdivided into four sub-units, each of which will be discussed briefly. The Lower Getaway member is a limestone that has different characteristics based on its location in the Delaware Basin, and contains patch reefs close to the basin margin. These reefs are often found on limestone conglomerate and breccias. The Upper Getaway Member is more consistent and is characterised as a thick bedded dolomite which integrates into the San Andres Formation as it moves toward the shelf. The middle unit of the Cherry Canyon Formation is the South Wells Member, which is composed of sandstone and integrates itself into the Goat Seep Reef as it moves towards the basin shelf. The upper unit is the Manzanita Member, which consists of dolomite, and gets pinched out underneath the Capitan Formation as it moves into the basin margins. All four members of the Cherry Canyon Formation have undergone dolomitization near the basin margins. This is evident since the calcite/aragonite bioclastic debris that existed as a part of this formation has been preserved as molds in dolomite. It has been suggested by some authors that the clasts and debris might have been dolomitic upon deposition, but that is improbable since the debris came from the reef, which was not dolomitic. The Bell Canyon Formation is the next unit in the Delaware Mountain Group, and it is the age equivalent unit to the Capitan Reef Formation which formed on the shelf. The Bell Canyon Formation consists of “un-fossiliferous, dark-gray to black, platy, fine-grained limestone”. All the Cherry Canyon Formation and the bottom part of the Bell Canyon Formation have thin interbeds of dark-colored bioclastic limestone and fine-grained sandstone. As these formations move towards the basin margins, the sandstone wedges out and the limestone thickens into massive, meters thick beds, containing reef talus. The Goat Seep Reef Formation lies on the shelf margin and integrates with the Getaway Formation in the basin and the San Andres Formation towards the Shelf. This formation is described as 1,150 feet (350 m) thick, one mile (1,600 m) long, and made up entirely of massive dolomite. In the bottom half of the formation, the dolomite is stratified into massive beds. This formation also contains molds of organisms destroyed by the dolomitization process. The Guadalupian Epoch is one of the most successful in history in terms of reef building, since most Permian reefs reached their maximum in size, diversity, extent, and abundance during this Epoch, with the Capitan Reef being one of the most famous examples. In the Guadalupian, reefs were abundant globally, and grew in places such as the Delaware Basin, the Zechstein Basin in Eastern Europe, along the Tethys Ocean, and in cool water shelves in the Panthalassa Ocean. The end of this golden age for reef building occurred due to the “end-Guadalupian reef crisis”, which involved global drops in sea levels and regional salinity fluctuations. The movement and collision of micro-continents during the break up of Pangea also caused the destruction of many Guadalupian Reefs. Even with the number of reefs from that epoch that have been destroyed, there are over 100 Guadalupian reefs that remain in the world, the most from any Permian epoch. The growth of the Capitan Reef, which is referred to as a “massive member” due to it being formed from massive limestone, can be described in three stages. The first stage is the establishment of the reef and its rapid growth. Due to the slower rates of subsidence of this time, the reef was able to build itself up quickly. Once the reef reached sea level, it began to grow horizontally, since it could not grow vertically anymore. The reef environment during the first stage of development was described as warm (around 68 °F (20 °C)), shallow, high energy, clear water that was free from debris and which had a normal salinity level of 27 to 40 ppt (parts per thousand). The basin water provided plenty of nutrients, since there was continuous upwelling of water that mixed newly brought marine water with anoxic water from the basin floor. The makeup of the reef is described as being built primarily from erect sponges, which have large, rigid skeletons, and abundant red algae, microbial micrite, and inorganic cement. The microbial micrite worked to trap sediment. One of the most prominent sponges that made up the Capitan Reef was the sponge family Guadalupiidae, a sponge that first appeared on Glass Mountains in the mid Permian and had spread into the Delaware Basin by the late Permian. There were more environmental changes to mark the second stage of the formation of the Capitan Reef. This period of growth was marked by eustatic changes in global sea levels, due to frequent glaciations. The reef experienced major growth vertically at this stage and grew at a rapid enough pace to keep up with rising sea levels. The Capitan Reef also found a stable foundation on the reef debris and talus that rested on its slopes, and this foundation allowed the reef to grow outward. In some locations, nutrients and minerals were so abundant that the Capitan Reef grew out almost 50 km from the starting point. The third stage of the Capitan Reef is the death of the reef system. Ocean currents in the Permian played a huge role in setting up the climate of the region and for aiding in the growth and death of the Capitan Reef. The climate of the basin region was hot and arid, which is shown in the evaporite deposits that can be found in the back reef region. The end in growth and accumulation of the Permian Reef Complex was influenced by tectonics. During the end of the Permian Period, the supercontinent of Pangaea was beginning its break up, which drastically changed the conditions that were previously favourable for reef growth. Change in tectonics limited the exchange of sea water in the Hovey Channel, which then led to a salinity increase in the Permian Basin. The reef could not survive this drastic change in water salinity, and was therefore destroyed. Up until the Guadalupian, the Permian Basin had adequate water circulation with fresh water coming in from the Hovey Channel. Evaporite growth along the bottom portions of the basin showed that the water column was most likely stratified and euxinic, meaning the water was both anoxic and sulfidic. The passageways between the Delaware and Midland Basins were restricted due to tectonic changes, and this caused the salinity of the water to rise. The growing temperatures in the late Permian combined with the increase in salinity caused the extinction of the Capitan Reef, as well as the formation of evaporites with the basin. The layers of evaporites that formed as a result of increased salinity is called the Castile Formation. This formation consists of alternating layers of gypsum/anhydrite and limestone, as well as massive beds of gypsum/anhydrite, salt, and some limestone. The unit measures almost 4,300 feet (1,300 m) in total and was formed during the Lopingian Epoch. The individual layers (laminae) of gypsum/anhydrite are between 0.039 inches (1 mm) and 3.9 inches (10 cm) in thickness, which is thought to correlate with the basin salinity on a year by year basis. The Capitan Reef had been altered diagenetically early on in its history, especially after the deposition of the Castile Formation. There is evidence of fabric alteration throughout this formation, which is thought to indicate the dehydration and rehydration process of the gypsum and anhydrites. There is also evidence of evaporite calcitization. The reef system was buried until it was exposed in the Mesozoic Era as a result of tectonic activity by the Laramide Orogeny. The deep water shale and carbonate reefs of the Delaware and Midland Basins and the Central Basin Platform would become lucrative hydrocarbon reservoirs. The Permian basin is divided into generalized facies belts differentiated by the depositional environment in which they formed, influenced by sea level, climate, salinity, and access to the sea. Lowering sea level exposes the peritidal and potentially, the shelf margin regions, allowing linear channel sandstones to cut into the shelf, extending beyond the shelf margin atop the slope carbonates, fanning outward toward the basin. The tidal flats during a lowstand contain aeolian sandstones and siltstones atop supratidal lithofacies of the transgressive systems tract. The basin fill during a lowstand is composed of thin carbonate beds intermingled with sandstone and siltstone at the shelf and sandstone beds within the basin. These facies results from the abrupt deepening of the basin and the reestablishment of carbonate production. Carbonates such as bioturbated wackstone and oxygen poor lime mud accumulate atop the underlying lowstand systems tract sandstones in the basin and on the slope. The tidal flats are characterized by supratidal faces of hot and arid climate such as dolomudstones and dolopackstones. The basin is characterized by thick carbonate beds on or close to the shelf with the shelf margin becoming progressively steeper and the basin sandstones becoming thinner. Highstand systems tract facies results from the slowing down in the rise of sea level. It is characterized by carbonate production on the shelf margin and dominant carbonate deposition throughout the basin. The lithofacies is of thick beds of carbonates on the shelf and shelf margin and thin sandstone beds on the slope. The basin becomes restricted by the formation of red beds on the shelf, creating evaporites in the basin. During the Cambrian–Mississippian, the ancestral Permian Basin was the broad marine passive margin Tobosa Basin containing deposits of carbonates and clastics. In the early Pennsylvanian–early Permian the collision of North American and Gondwana Land (South America and Africa) caused the Hercynian orogeny. The Hercynian Orogeny resulted in the Tobosa basin being differentiated into two deep basins (the Delaware and the Midland Basins) surrounded by shallow shelves. During the Permian, the basin became structurally stable and filled with clastics in the basin and carbonates on the shelves. This passive margin succession is present throughout the southwestern US and is up to 0.93 miles (1.50 km) thick. The ancestral Permian basin is characterized by weak crustal extension and low subsidence in which the Tobosa basin developed. The Tobosa basin contained shelf carbonates and shales. The two lobed geometry of the Permian basin separated by a platform was the result of the Hercynian collisional orogeny during the collision of North America and Gondwana Land (South America and Africa). This collision uplifted the Ouachita-Marathon fold belt and deformed the Tobosa Basin. The Delaware Basin resulted from tilting along areas of Proterozoic weakness in Tobosa basin. Southwestern compression reactivated steeply dipping thrust faults and uplifted the Central Basin ridge. Folding of the basement terrane split the basin into the Delaware basin to the west and the Midland Basin to the east. Rapid sedimentation of clastics, carbonate platforms and shelves, and evaporites proceeded synorogenically. Bursts of orogenic activity are divided by three angular unconformities in basin strata. Evaporite deposits in the small remnant basin mark the final stage of sedimentation as the basin became restricted from the sea during sea level fall. The Permian Basin is the largest petroleum-producing basin in the United States and has produced a cumulative 28.9 billion barrels of oil and 75 trillion cubic feet of gas. Currently, nearly 2 million barrels of oil a day are being pumped from the basin. Eighty percent of estimated reserves are located at less than 10,000 feet (3,000 m) depth. Ten percent of the oil recovered from the Permian Basin has come from Pennsylvanian carbonates. The largest reservoirs are within the Central Basin Platform, the Northwestern and Eastern shelves, and within Delaware Basin sandstones. The Primary lithologies of the major hydrocarbon reservoirs are limestone, dolomite, and sandstone due to their high porosities. However, advances in hydrocarbon recovery such as horizontal drilling and hydraulic fracturing have expanded production into unconventional, tight oil shales such as those found in the Wolfcamp Shale. Oil reserves in the Permian Basin were first documented by W.H Abrams in Mitchell County, West Texas in 1920. The first commercial well was opened a year later in 1921, in the newly discovered Westbrook Oil Field in Mitchell County, at a depth of 2,498 feet (761 m). Initially, the Permian Basin was thought to have a bowl-like shape, with geological survey crews unable to study the inside of the basin due to a lack of outcrops. The next few years contained discoveries of multiple oil fields, such as the World oil field, McCamey oil field (discovered in 1925), and the Yates oil field (1926). All of these discoveries were made by random drilling or sub-surfacing mapping. Geophysical tests were vital in mapping the region, since tools such as seismographs and magnetometers were used to find anomalies in the area. Due to distances and lack of pipes in which to move oil, deep drilling tests were not done in the 1920's since the cost was unjustified. As a result, all the oil wells up to 1928 were less than 5,000 feet (1,500 m) deep. During World War II the need for oil in the US became urgent, justifying the high costs of deep oil drilling. This breakthough led to major oil reservoirs being found in every geological formation from the Cambrian Period to the Permian Period. in 1966, the production of the Permian Basin measured 600 million barrels of oil, along with 2.3 trillion cubic ft of gas, which totaled $2 billion. The production values steadily increased thanks to the installation of gas pipelines and oil refineries in the area, reaching a total production of over 14.9 billion barrels in 1993. In addition to oil, one of the main commodities that is mined from the Permian Basin is potash, which was first discovered in the region in the late 1800's by geologist Johan August Udden. Early studies by Udden led to the United States Geological Survey exploring the area in search of potash, which was highly important during World War I as the US could no longer import it from Germany. by the mid 1960's, seven potash mines were operating on the New Mexico side of the Permian Basin. As of 2018, the Permian Basin has produced more than 33 billion barrels of oil, along with 118 trillion cubic feet of natural gas. This production accounts for 20% of US crude oil production and 7% of US dry natural gas production. While the production was thought to have peaked in the early 1970's, new technologies for oil extraction, such as hydraulic fracturing and horizontal drilling have increased production dramatically. Estimates from the Energy Information Administration have predicted that proven reserves in the Permian Basin still hold 5 billion barrels of oil and approximately 19 trillion cubic feet of natural gas. Map of the part of the region in Texas. Red is the core; pink represents the counties sometimes included in the region. According to the 2008/2009 census, the Permian Basin had a total population of 522,568. When including those counties, the population of the Permian Basin reaches 577,667. ^ B. R. Alto and R. S. Fulton (1965) "Salines" and "The potash industry" in Mineral and Water Resources of New Mexico, New Mexico Bureau of Mines and Mineral Resources, Bulletin 87, p.299–309. ^ Galley, John (1995). "Oil and Geology in the Permian Basin of Texas and New Mexico". ^ a b Wright, Wayne (2011). "Pennsylvanian paleodepositional evolution of the greater Permian Basin, Texas and New Mexico: Depositional systems and hydrocarbon reservoir analysis". AAPG Bulletin. 95 (9): 1525–1555. doi:10.1306/01031110127. ^ a b c d e f g h i j k Hill, Carol A. (1996). Geology of the Delaware Basin, Guadalupe, Apache, and Glass Mountains, New Mexico and West Texas. Permian Basin Section-SEPM. OCLC 994835616. ^ a b c Weidlich, Oliver (December 2002). "Permian reefs re-examined: extrinsic control mechanisms of gradual and abrupt changes during 40 my of reef evolution". Geobios. 35: 287–294. doi:10.1016/s0016-6995(02)00066-9. ISSN 0016-6995. ^ Stafford, P. T., 1959, Geology of Part of the Horseshoe Atoll in Scurry and Kent Counties, Texas, USGS Professional Paper 315-A, Washington: US Dept. of Interior, p. 2. ^ Vest, E. L. Jr., 1970, Oil Fields of Pennsylvanian-Permian Horseshoe Atoll, West Texas, AAPG Memoir 14: Geology of Giant Petroleum Fields, Tulsa: AAPG, pp. 185–186. ^ Vest, E. L. Jr., 1970, Oil Fields of Pennsylvanian–Permian Horseshoe Atoll, West Texas, AAPG Memoir 14: Geology of Giant Petroleum Fields, Tulsa: AAPG, p. 185. ^ Vest, E. L. Jr., 1970, Oil Fields of Pennsylvanian-Permian Horseshoe Atoll, West Texas, AAPG Memoir 14: Geology of Giant Petroleum Fields, Tulsa: AAPG, p. 186. ^ Stafford, P. T., 1959, Geology of Part of the Horseshoe Atoll in Scurry and Kent Counties, Texas, USGS Professional Paper 315-A, Washington: US Dept. of Interior, p. 6. ^ Stafford, P. T., 1959, Geology of Part of the Horseshoe Atoll in Scurry and Kent Counties, Texas, USGS Professional Paper 315-A, Washington: US Dept. of Interior, p. 8. ^ "1000 Ma large mafic magmatic events". Large Igneous Provinces Commission. Retrieved 12 April 2019. ^ Stafford, Kevin W.; Ulmer-Scholle, Dana; Rosales-Lagarde, Laura (September 2008). "Hypogene calcitization: Evaporite diagenesis in the western Delaware Basin". Carbonates and Evaporites. 23 (2): 89–103. doi:10.1007/bf03176155. ISSN 0891-2556. ^ Weidlich, Oliver (December 2002). "Permian reefs re-examined: extrinsic control mechanisms of gradual and abrupt changes during 40 my of reef evolution". Geobios. 35: 287–294. doi:10.1016/s0016-6995(02)00066-9. ISSN 0016-6995. ^ a b Hayes, Philip Thayer (1964). "Geology of the Guadalupe Mountains, New Mexico". Professional Paper. doi:10.3133/pp446. ISSN 2330-7102. ^ Standen, Allan R.; Finch, Steve; Williams, Randy; Lee-Brand, Beronica (2009). Capitan Reef Complex Structure and Stratigraphy (PDF). Assisted by Paul Kirby. Daniel B. Stephens & Associates. OCLC 612327902 – via Texas Water Development Board. ^ a b c d e f g h i Newell, Norman D. (1972). The Permian Reef Complex of the Guadalupe Mountains Region, Texas and New Mexico : a study in paleoecology. Hafner. OCLC 637101696. ^ Harris, G.A. ; Tuttle, E. (1990). Geology of National Parks. Kendall/Hunt Publishing. ^ Fagerstrom, J. A.; Weidlich, O. (February 1999). "Origin of the upper Capitan-Massive limestone (Permian), Guadalupe Mountains, New Mexico–Texas: Is it a reef?". GSA Bulletin. 111 (2): 159–176. doi:10.1130/0016-7606(1999)111<0159:OOTUCM>2.3.CO;2. ^ Hills, John M. (1972). "Late Paleozoic Sedimentation in West Texas Permian Basin". AAPG Bulletin. 56 (12). doi:10.1306/819a421c-16c5-11d7-8645000102c1865d. ISSN 0149-1423. ^ a b Scholle, Peter A.; Ulmer, Dana S.; Melim, Leslie A. (April 1992). "Late-stage calcites in the Permian Capitan Formation and its equivalents, Delaware Basin margin, west Texas and New Mexico: evidence for replacement of precursor evaporites". Sedimentology. 39 (2): 207–234. doi:10.1111/j.1365-3091.1992.tb01035.x. ISSN 0037-0746. ^ Maley, V. C.; Huffington, Roy M. (1953). "Cenozoic Fill and Evaporate Solution in the Delaware Basin, Texas and New Mexico". Geological Society of America Bulletin. 64 (5): 539. doi:10.1130/0016-7606(1953)64[539:cfaesi]2.0.co;2. ISSN 0016-7606. ^ Siver, Burr (1969). "Permian Cyclic Strata, Northern Midland and Delaware Basins, West Texas and Southeastern New Mexico". AAPG Bulletin. 53 (11). doi:10.1306/5d25c94d-16c1-11d7-8645000102c1865d. ^ a b Hills, J.M. (1984). "Sedimentation, tectonism, and hydrocarbon generation in the Delaware basin, West Texas and Southeastern New Mexico". AAPG Bulletin. 68: 250–267. doi:10.1306/ad460a08-16f7-11d7-8645000102c1865d. ^ a b Horak, R.L. (May 27, 1985). "Tectonic and hydrocarbon maturation history in the Permian basin". Oil and Gas Journal: 124–129. ^ a b c Vertrees, Charles D. (2010-06-15). "Permian Basin". Handbook of Texas Online. Retrieved 12 April 2019 – via Texas State Historical Association. ^ US Department of Energy (November 2018). "Permian Basin Geology Review" (PDF). This page was last edited on 16 April 2019, at 06:09 (UTC).